Angelic Designs is owned by a good friend who has sent her inventory to me to sell. These beautiful pieces of jewelry are so popular. Please take note of the quantity listed with each photo and description as once that quantity runs out there will be no more. Below is the price sign as well as the usage disclaimer that should be read before purchasing. Please take note that pregnant women or anyone that wears a pacemaker or any other electrical implant or device for medical reasons of any kind should not use magnetic jewelry without consulting your doctor first. Children under 12 are not advised to wear due to choking hazard. More information can be found in the Disclaimer below. 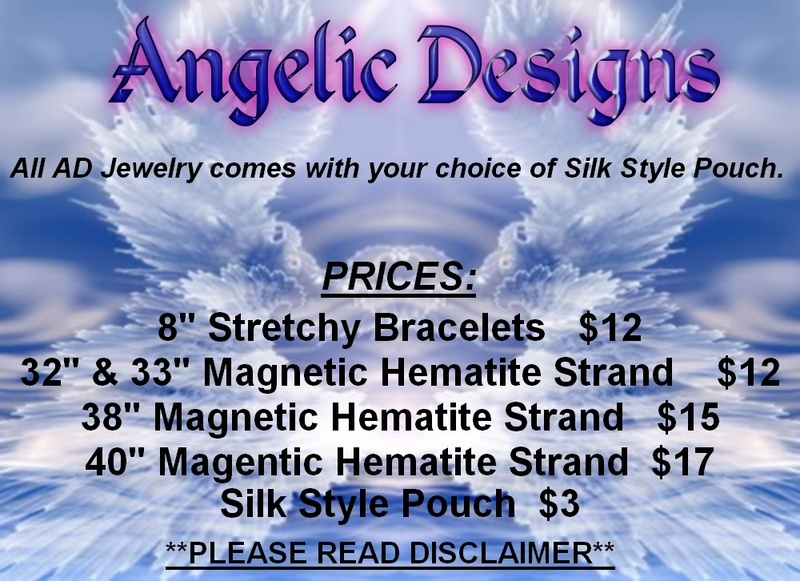 There is an information sheet below the disclaimer with information regarding the possible benefits of magnetic jewelry. Hematite gets its name from the Greek haimo for "blood," because of the color of its powder. This stone is a compact form of iron oxide. It is harder than pure iron, but much more brittle. Due to its fragile, glass-like nature, great care should be taken in handling hematite items. Its color can vary from a black steel color to a brownish red. Gemstone quality hematite is a silvery opaque stone that almost looks like metal. Like nearly all commercially available "hematite" beads, this hematite is a simulated material virtually identical to real hematite. It even has the same chemical composition - both genuine and simulated hematite are iron oxide. It looks and reacts to tests very much like natural hematite - it is hard to them apart. Natural hematite is rare and expensive. These beads are made from hematite pieces and dust that have been ground up and fused into shape. Some companies call them "hemalike", "hemalyke", or "hematine" to designate they are manufactured. The simulated material is much easier to produce in detailed shapes, and looks and feels like the real material. The bottom line: Even though a few vendors still say their hematite-style beads are a natural material, most mass-produced hematite beads are the simulated product. The simulated material and the genuine are so similar in look and feel that vendors might not question their suppliers and may inadvertently mislead the customer. This gemstone is created by magnetizing simulated hematite (natural hematite cannot be magnetized!) Magnetized hematite is similar to magnetite, a naturally occurring relative of hematite. Both stones are forms of iron oxide, but with slightly different formulas (magnetite is Fe3O4, while hematite is Fe2O3). I prefer to use the manufactured beads because they are consistent in magnetic strength. 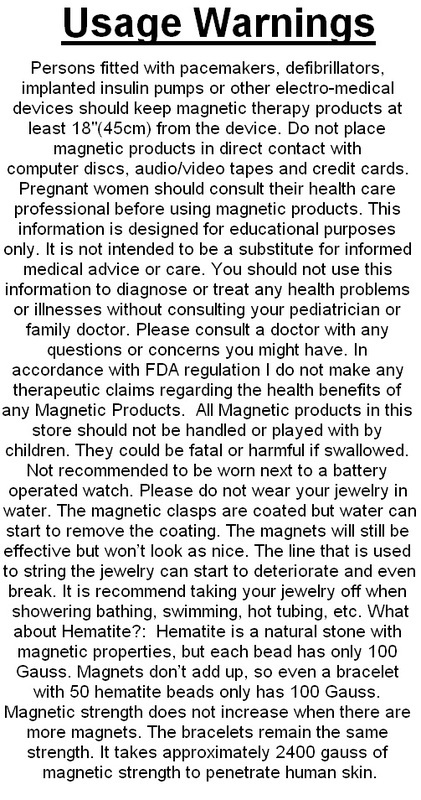 This is important if you intend to use the magnetic jewelry for health purposes. Magnetite may be very powerful or very weak. These manufactured hematite beads have the advantage of always being the same strength. Potential Benefits of Magnetic HematiteA wide variety of health benefits have been attributed to magnetic jewelry. It is said to maintain the natural charge of the nerve cells, thus reducing pain; increase the healing process; boost the immune system; improve quality of sleep; relieve ailments of the hands, wrists and fingers; and generally enhance physical energy and vitality. It also is reported to help tension headaches and light migraines. In some circumstances people have recorded a difference within 48 hours of putting on the stones. The story behind natural hematite is still relevant to this gemstone, especially considering real hematite is used to make it. Magnetic jewelry can cause the iron in the blood to act as a conductor of the magnetic field, thus producing magnetic energy. This purportedly improves blood flow which in turn increases the efficiency of oxygen & nutrient delivery to the tissues. Hematite is also said to stimulate iron absorption in the small intestine, which in turn improves oxygen supply to the body. It can also be used to aid circulation and to help combat anemia. This gemstone can be used to treat leg cramps, nervous disorders and insomnia. Hematite can also be used to cool the body and draw fever from the forehead. It also stimulates the kidneys in cleansing blood. Hematite can also be used to help with spinal alignment and the proper healing of breaks or fractures in bones. It also may help to provide a stable equilibrium between the ethereal nervous system and the physical nervous system. Hematite can help to balance out the emotions and energies between the body, mind and spirit. It is said to be a healing and grounding stone, that strengthens the body and improves resistance to life's stresses. Hematite is used for increasing intuition and to improve relationships. It is said to form a reflective shield around the wearer, letting negativity bounce off and return to the sender. The bearer should remember, however, that their own negativity will be reflected to them if they are its source. The calming stone can also offer support for your hopes, dreams, wishes and desires. Hematite can remind you that the only limitations that exist are those that you place upon yourself. Many believe it to aid clarity, balance and calm reason, thus making it a grounding stone. It also is supposed to dissolve negativity and transform it into love. For this reason, it assists in the creation of peaceful, loving, kind relationships. Hematite can help one sort out things in ones own mind. It can be used to boost self-esteem and impart confidence. It has also been used for overcoming addictions and compulsions. Hematite may stimulate concentration and focus. It may also enhance memory and original thought.